This article is about the comics storyline. For the 2014 film, see X-Men: Days of Future Past. For other uses, see Days of Future Past (disambiguation). Not to be confused with Days of Future Passed. The storyline was produced during the franchise's rise to popularity under the writer/artist team of Chris Claremont, John Byrne and Terry Austin. The dark future seen in the story has been revisited numerous times, and was the basis for the 2014 similarly-titled feature film X-Men: Days of Future Past, wherein Wolverine is sent back in time. In 2001, fans voted the first issue of this storyline the 25th greatest Marvel comic. The Official Handbook to the Marvel Universe: Alternate Universes 2005 gave the numerical designation for the original "Days of Future Past" timeline as Earth-811 in the Marvel Multiverse. The storyline alternates between the present year of 1980 and the future year of 2013. In the future, Sentinels rule a dystopian United States, and mutants are hunted and placed in internment camps. Having conquered North America and hunted all mutants and other superhumans, the Sentinels are turning their attention to the rest of the world. On the eve of a feared nuclear holocaust, the few remaining X-Men send Kitty Pryde's mind backward through time, to possess the body of her younger-self and to prevent a pivotal event in mutant–human history and the cause of these events: the assassination of Senator Robert Kelly by Mystique's newly reassembled Brotherhood of Evil Mutants. Working with the present-day X-Men, Kitty Pryde's future-self succeeds in her mission and is pulled back to her own time, while her present-day-self is returned with no memory of any interim. The world of 2013 is not shown again in this story arc; the present-day X-Men are left to ponder whether their future dystopia has been averted or simply delayed. John Byrne devised the plot for "Days of Future Past", since he wanted to do a story featuring the Sentinels and his collaborator Chris Claremont had no interest in coming up with one. Years later, Byrne said, he realized that he had unconsciously lifted the "spine" of the plot from the 1972 Doctor Who serial "Day of the Daleks". Though Byrne had intended "Days of Future Past" to be a completely self-contained story, with the future world seen in the story no longer existing even as an alternate timeline following the conclusion, a number of stories have revisited this future and even acted as outright sequels. Rachel Summers, a character seen in the future segments of "Days of Future Past", later travels through time to the present day and joins the X-Men. A supervillain, Ahab, follows her to the present in the "Days of Future Present" crossover. In this story, Ahab kidnaps the children Franklin Richards (son of Mister Fantastic and the Invisible Woman and, in the future timeline, Rachel's lover) and Nathan Summers (son of Cyclops and Madelyne Pryor) but is defeated by the X-Men, X-Factor, the New Mutants and the Fantastic Four. Rachel joins the European mutant team Excalibur, whose series twice revisited the "Days of Future Past" timeline. The first time was in a story by Alan Davis entitled "Days of Future Yet To Come", in which a time-traveling Excalibur and several Marvel UK heroes overthrow the Sentinel rulers of future America. This storyline also reveals that Excalibur's robotic "mascot" Widget had been possessed by the spirit of the future Kitty Pryde. A prelude to "Days of Future Past" was produced in a three-part mini-series entitled "Wolverine: Days of Future Past". This three-issue mini dealt with ramifications between the catalyst for the creation of the alternative future up until the main storyline in Uncanny X-Men 141–142. The prelude explains why Logan leaves for Canada and why Magneto is in a wheelchair in the main two issue story. Another view of this reality was presented in the second issue of Hulk: Broken Worlds. A short story, "Out of Time", examines the life of Bruce Banner (the Hulk) in a Sentinel prison camp. Years of Future Past (2015). A sequel based on the original storyline written by Marguerite Bennett, Years of Future Past, was released in June 2015, featuring the "Days of Future Past" timeline depicted in the 2015 "Secret Wars" storyline. The setting of the timeline on Battleworld is called the Sentinel Territories. Major characters in the series include Christina Pryde and Cameron, the children of Kate Pryde and Colossus. Christina "Chrissie" Pryde is the youngest mutant in existence. Fifteen years ago, the Baron of the United Doomstates, President Kelly, created the Mutant Control Act, which put all mutants in internment camps, locking mutants away, creating collars to disable their abilities, and sterilizing them. Chrissie goes looking for a chemical which will disable their collars. Taking the chemical back to her mother, and, after reuniting with her father, Uncle Erik, and Aunt Rachel, they break out of their camp, and Chrissie uses her newly awakened powers to change into liquid metal and destroy an attacking Sentinel. Meanwhile, President Kelly has hired a team to document footage of mutants killing each other, as soon the American people will vote on whether or not to reform the control act. However, the group of mutants have discovered a virus in the Sentinels to kill the president, and they want Chrissie and Logan's son, Cameron, to save him, believing the image of mutants saving the president will stop the control act once and for all. After a fight against Blob and Mystique, they are attacked by a new form of the Sentinels. The X-Men and Mystique escape underground after Cameron kills Blob, and subsequently travel to Centrum, an underground refuge for mutants. Using a downed Sentinel, it is discovered that President Kelly was fabricating an attack on himself so he could blame mutants. Sentinels then pierce the ceiling, having found Centrum. To counter the assault, Kitty Pryde reaches out Centrum's final defense: a giant-sized Lockheed. After waking up Lockheed, Kate, Cameron and Chrissie helped the rest of the X-Men evacuate Centrum. During the evacuation, Kate accidentally slipped out a revelation regarding Cameron's parentage, he wasn't the son of Wolverine, but the son of Kate and Colossus, who Wolverine had taken under his wing as a baby after Kate and Piotr had been captured by Sentinels. Kate took her two children to the Doom Cathedral in Coney Island, a sacred place run by Nightcrawler they could use as a refuge. After Kate and Cameron assimilated the recent reveal, Kurt and Kate showed them a mutant camp in front of the church, revealing that they could free its inhabitants and protect them with the laws of the sanctuary. Cameron showed disapproval of freeing them at that moment, but he was forced to act when Chrissie jumped into action. When the four mutants finally broke in they found it was a trap, as Pyro, Avalanche and Destiny were waiting for them. While the rest of the X-Men escaped from the ruins of Centrum, Chrissie was able to convince the mutants at the mutant camp to fight with them. After Avalanche was killed and Pyro was subdued, Destiny and Kelly's forces were finally defeated when the X-Men arrived with Magneto controlling the Sentinel from Centrum as a weapon. Cameron discovered the old Sentinel from Centrum had three DNA sequences programmed into it. While one was Kelly's, the other two were Chrissie's and Cameron's. It was revealed Magneto had actually reprogrammed the Sentinel with Rachel Summers to attack Chrissie and Cameron to become martyrs, and they had used the rest of the X-Men for their plan. When he was being confronted, Magneto captured Chrissie and flew away with the Sentinel. Cameron snuck into the robot, and killed Magneto, causing the Sentinel to fall to the ground. Chrissie confronted Cameron for killing Magneto, and he revealed he believed mutants did not deserve to exist, as they had caused the dystopia they now lived in. Cameron would then try to kill President Kelly and cause him to destroy mutants, so the Sentinel Territories could be peaceful without them. Chrissie opposed him, and the two siblings started fighting. After a hard-fought battle, Cameron escaped, challenging Chrissie to meet him at the National Plaza, where the X-Men forced Air Force One to land. Cameron arrived brief moments later, and broke into Air Force One, taking President hostage. Chrissie arrived soon after, riding Lockheed with Logan and Kate. While the X-Men fended off Sentinels and President Kelly's troops, Chrissie got to President Kelly and helped get him to safety with Lockheed. Chrissie then asked him to reconsider the mutant reform act. Using the dragon's fire, Chrissie heated up her metal blades and confronted her brother for the last time because she saw herself forced to kill him. After the dust settled, the X-Men fled the scene and returned to Nightcrawler's church. President Kelly's forces asked for permission to fire at them, but he ordered them to stand down. Once the mutants arrived at the church, they heard helicopters and sirens coming at them. The mutants were unsure whether the arriving group were ally or enemy forces. The "Days of Future Past" storyline was adapted in the X-Men animated series. The storyline concepts were combined with another alternative future story—that of Bishop and the idea of a traitor within the ranks of the X-Men, though Mystique is still responsible for Senator Kelly's assassination. Bishop plays the role of Kitty Pryde in the adaptation-albeit traveling completely back in time instead of just projecting his mind into his past self-while the 'traitor' is 'revealed' to be Gambit, with the X-Men's interference revealing that Mystique had killed Senator Kelly while in Gambit's appearance to try and frame the X-Men. The series Wolverine and the X-Men has a similar storyline, where Professor X is in a coma for 20 years, and awakens to find that the mutants are imprisoned by the Sentinels. He telepathically connects with the X-Men of the past to try to prevent that future from happening. By the end of the first season, the Sentinel-dominated future was averted. However, a future based on the Age of Apocalypse appeared in its place. The series stopped production before the second season revolving around this could be made. A Days of Future Past incarnation appeared in The Super Hero Squad Show episode "Days, Nights, and Weekends of Future Past". A Madland level based on "Days of Future Past" appears in the Ultimate Spider-Man episode "Game Over". Mutant Arcade designs the level under the basis of Sentinels being used to destroy mutants. The scenario features a shot of Wolverine being blasted by a Sentinel in an homage to the cover of Uncanny X-Men No. 142. Hulk and the Agents of S.M.A.S.H. features a five-part episode entitled Days of Future Smash, which consists of the Hulk chasing the Leader throughout numerous events of time and space. The episode's title is a reference to Days of Future Past. X-Men: Days of Future Past is a sequel to First Class. Several actors from the franchise returned, including Hugh Jackman, Halle Berry, Ian McKellen, Patrick Stewart, James McAvoy, Michael Fassbender, Anna Paquin, Ellen Page, Shawn Ashmore, Daniel Cudmore, Nicholas Hoult, Jennifer Lawrence, and Lucas Till. Newcomers Peter Dinklage, Omar Sy, Adan Canto, Fan Bingbing, Booboo Stewart and Evan Peters were also signed to play Bolivar Trask, Bishop, Sunspot, Blink, Warpath and Quicksilver, respectively. Although Wolverine is the one to actually return to his "younger" body, director Bryan Singer described Pryde as the prime facilitator and it is Pryde's phasing ability that enables time travel to happen. In this film, the catalyst for the Sentinel-dominated future was Mystique's assassination of Bolivar Trask and her subsequent capture, with analysis of her DNA allowing humanity to devise Sentinels that can rapidly adapt to mutant powers. 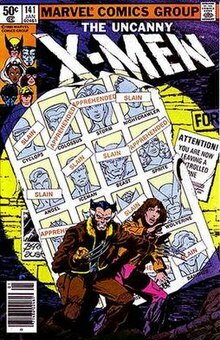 After Shadowcat learns how to use her abilities to 'phase' someone into their past self, the surviving mutants decide to send someone back in time to the 1970s to prevent Mystique from killing Trask, with Wolverine being selected as the process is so physically dangerous that he is the only person who could survive the strain, making contact with the past versions of Xavier, Hank McCoy and Magneto despite Xavier being currently powerless-using a serum that allows him to walk while suppressing his powers-and Magneto initially in prison for his apparent role in the Kennedy assassination. Although the past Magneto nearly jeopardizes the plan when he tries to kill Mystique and later take control of the Sentinels to attack humans, Wolverine is able to work with the younger Xavier and McCoy—including one scene where he acts as a psychic 'bridge' so that the younger Xavier can communicate with his future self—to give the young Xavier a chance to talk Mystique down, resulting in her being publicly shown defending President Richard Nixon from Magneto. Trask is later arrested for trying to sell his designs to foreign powers after failing to get the United States government to accept his plans. The film ends showing Wolverine waking up in a changed future where there are no Sentinels and the previously-deceased Cyclops and Jean Grey are once again alive. Ultimate Marvel vs. Capcom 3 has a "Days of Future Past"-inspired stage serving as an alternative to the standard Metro City stage, with an "Apprehended"/"Slain" poster similar to the famous one, featuring characters from both Marvel and Capcom that starred in Marvel vs. Capcom 2: New Age of Heroes, but did not return for the Marvel vs. Capcom 3 games. Taking the place of the playable Wolverine is Mega Man. To coincide with the release of the film, GlitchSoft, an mobile app developer, released The Uncanny X-Men: Days of Future Past for iOS and Android devices. The game is side-scrolling 2-D action adventure, with a storyline closer to the original comic book, than the one portrayed in the film. Initially players will be able to control Wolverine, and as they advance further in the game, they will be able to choose between Kitty Pryde, Colossus, Scarlet Witch and Cyclops, with Storm, Polaris and Magneto announced as additional characters, each one with different powers and abilities, which is upgradable as the player progress in the game, by obtaining experience points. The ending of the X-Men Origins: Wolverine video game is set in a not so distant future where Wolverine (in an X-Men costume) breaks free from captivity by Bolivar Trask to discover Sentinels have taken over the world. A novelization of the comic version of "Days of Future Past" by Alex Irvine was released in May 2014 by Marvel Comics that tied into the release of the film, X-Men: Days of Future Past. It essentially follows the plot of the original comic storyline, but with two particular changes to the events set in the future: Magneto survives the escape of the Sentinel camp and hides until his powers are restored to the point that he can annihilate the remaining Sentinels, and Kitty is conscious in the body of her future self rather than remaining comatose until she is returned to her own time. In "Genesis", the first episode of the television series Heroes, the character of Hiro Nakamura cites Kitty's traveling through time as teaching him about the concepts of time travel. Hiro states that the comic taught him that time is a circle, even though it actually insinuated that time branched. The episode "Five Years Gone" was a further homage to the story, featuring Hiro and his friend Ando travelling into a future where New York has been destroyed and people with abilities are being hunted, forcing them to travel back into the past to prevent the original explosion. ^ Claremont, Chris (January 1980). The Uncanny X-Men #141: Days of Future Past. Marvel Comics. ^ Claremont, Chris (February 1980). The Uncanny X-Men #142: Mind out of Time. Marvel Comics. ^ a b c Nickerson, Al (August 2008). "Claremont and Byrne: The Team that Made the X-Men Uncanny". Back Issue!. Raleigh, North Carolina: TwoMorrows Publishing (29): 10–11. ^ Excalibur #67. Marvel Comics. ^ Hulk: Broken Worlds Book 2. Marvel Comics. ^ Richards, Dave (March 11, 2015). "EXCLUSIVE: "Secret Wars" Resurrects a Mutant Nightmare in "Years of Future Past". Comic Book Resources. ^ a b Years of Futures Past #3. Marvel Comics. ^ Years of Future Past #1. Marvel Comics. ^ Years of Future Past #2. Marvel Comics. ^ "Uncanny X-Men Game for Mobile | Days of Future Past | Wolverine Game | iPhone | Android". GlitchSoft. Archived from the original on 2014-08-08. Retrieved 2014-08-06.